Lindi Region Commissioner, Godfrey Zambi wants Villages to urgently act in defense of their forests against illegal forest practice. 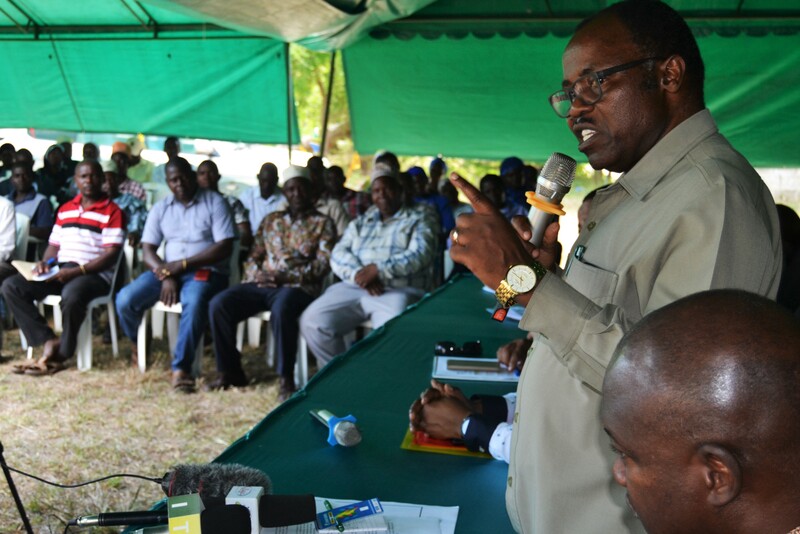 Speaking at the launch and handover of Solar Kiln to eleven villages in Kilwa district Council, Hon. Zambi said there was a need to start encouraging the villages to be accountable for their forest resources. ‘‘I know one of the biggest threat to forest in this region is illegal logging .And whenever there is illegal logging the villages usually say the government should come to address it. That is right but who is the Government? You are the government …..If you call yourselves the Village Councils it means you have the mandate and responsibility to manage, protect and account for your resources. Illegal logging has to come to an end. And since it is an inside job, as some individual doing that are within your villages, you can start providing solutions from within through law enforcement. We at higher level will support but you have to act immediately and be accountable. I support forest conservation and I won’t tolerate any kind of illegal harvesting or any other form of practices that are destructive to forests in this region’’. Rich in natural resources, villages in Lindi Region depend on forests for large proportion oftheir internal revenues. Emphasizing on the importance of forest conservation, Hon Zambi used example from a village which is part of WWF Forest Programme. ‘‘I visited Nanjirinji Village, and I was very much impressed with how they are turning their forests into opportunity for prosperity. I saw how they use their forest revenues to support improving health facilities, build schools, drill water wells, the list is endless massive progress. I applause WWF for their support! Such successes are lessons to us all that forest conservation is possible and tangible results can be derived from such efforts’’. Commenting on how to sustain forest management Hon. 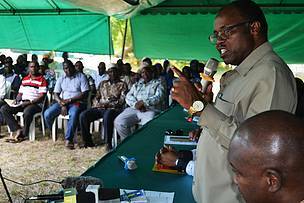 Zambi urged villages to invest in building the capacity of local forest experts. Stating that the Government Officials are not enough to provide extension services to every village. He also cautioned the Villages on how they should spend their revenues from forest. Expressing that diligence must be applied to ensure the villages at large benefit equally from conserving their forests. ‘’I want to take his opportunity to acknowledge the good work the villages are doing in conserving the forest. Keep up the good work because if we lose our forests we will lose productive land hence food, water, animal’s habitants; rain all that sustain our lives. On the same note be wise on how you invest from your forest revenue. We will hold you accountable! I support forest conservation and I won’t tolerate any kind of illegal harvesting or any other form of the forest destruction in this region’’. To date WWF and its partners have successfully brought over 400,000 ha of land under forest conservation .The Solar Kiln launch and handing over is part of WWFs effort to promote Participatory Forest Management (PFM) initiative through Community Based Forest Management (CBFM) that seek to promote forest conservation and create opportunities for communities to benefit from managing forest reserves under their village land. Convenient for rural setting, the solar kiln worth 120/= million has the carrying capacity of 20 cubic meters and provides high quality drying for timber particularly those orders with specific instructions on moisture content. Furthermore, low energy cost and low cost of supervision makes the solar kiln an environmental friendly and sustainable investment.